Rung on the Patronal Feastday of St Nicholas by members of the Southern District, Ladies Guild. Belated congratulations to Gerry Lynch, who was awarded the M.B.E. for meritorious work with the Registration Services of Scotland, (a friend of 1). Rung by an Eastern District Ladies Guild band. 400th Quarter Peal since the re-hanging of the bells. Rung by members of the Ladies Guild and friend. First in method - 2. First as cover - 6. Rung on the Patronal Festival, All Saints' Day, by members of the Ladies Guild (Southern District). Rung as an 8th Wedding Anniversary compliment for Jeannine & Colin Roe. All rung by members of the Ladies' Guild, Eastern District, and friend. Rung for Evensong by Members of the Southern District of the Ladies Guild. 1st Grandsire Doubles as Conductor. Rung by members of the Ladies Guild Eastern District as part of the Bellringers Strike Back Against Blood Cancer fundraising effort. Rung by Eastern District members and friend. 100th QP for 5. Wedding Anniversary compliment to Marie & Paul Carson. By members of The Marches District, Ladies' Guild. On the back five. 1st in variation for all. First in method as conductor - 8. To congratulate Nicola Murray (daughter of 5) on achieving a barrister pupillage. 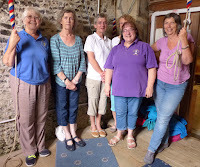 Rung by members of the Ladies Guild (Southern District), with a local ringer, on the 150th Anniversary of the birth of Beatrix Potter and dedicated to Mrs Tiggy-winkle. Thank you to Kate for standing in at short notice in place of Polly Osborne who had injured her foot the previous day. First of Minor, 4. Rung by members of the Ladies Guild, Southern District, to celebrate the life of Nell Penney, mother of Malcolm and a dear friend to many ringers. Rung by members of the South Midlands District Ladies Guild in memory of Iris Webb. Mary Williams, Hilary Aslett & Margaret Ingman would like to be associated with this Quarter Peal. 1260 Plain Bob Minor (rung with 7,8 covering). Rung by members of Ladies Guild Southern District to celebrate the 90th birthday of Queen Elizabeth II. A 'thank you' compliment to the organising committee of the Ladies Guild Norfolk Tour 2016 attended by 3, 5 and 6. All rung by members of the Southern District, Ladies Guild, with the assistance of an associated 'laddie' at Swanage, for their Quarter Peal Day. First quarter peal for the Ladies Guild, 6. Rung by members of the Southern District, for St George and in celebration of HM The Queen's 90th Birthday. Rung by members of the Eastern District and friend. For World Thinking Day. Birthday wishes to 5. Rung in remembrance of Freda Willgress and Betty Earl both longstanding members of the Ladies Guild South Midlands (formally Northants) District who died recently. Janet Wilkins and Mary Williams wished to be associated with the quarter. All rung by members of the Ladies Guild and associated "Laddies" to celebrate the 90th anniversary of the first peal on ten bells by an all ladies band on 20th January1926 of Stedman Caters here. 1260 Mixed Doubles (4m: 240 changes St Simons' and St Martins', 360 changes Plain Bob, 420 changes Grandsire). Both rung by members of the Ladies' Guild, Eastern District.